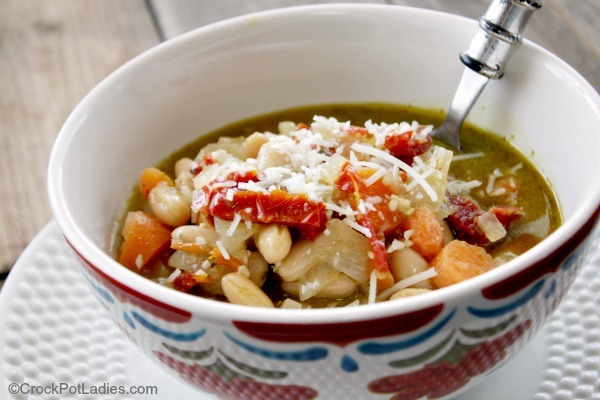 This easy vegetarian soup recipe for Crock-Pot Pesto Bean Soup is full of flavor! 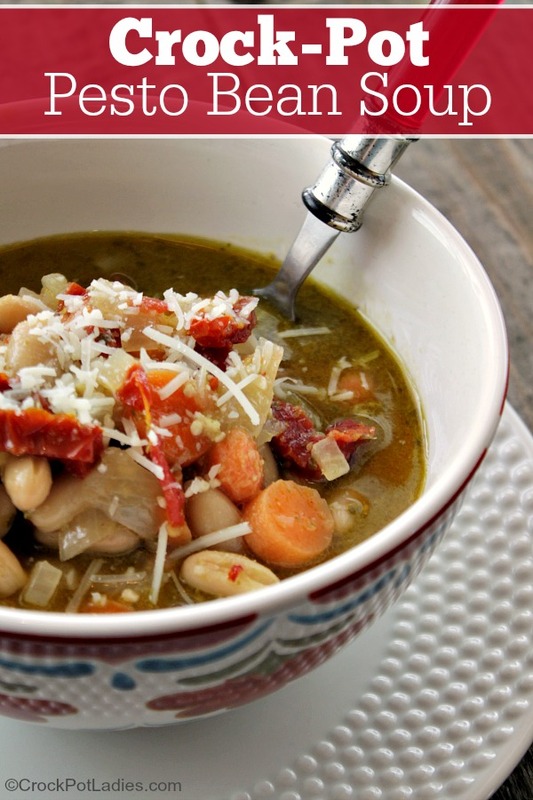 White beans, sun dried tomatoes & pesto are the outstanding flavors in this amazing soup! I know that most people associate soups with the cooler weather months in the autumn and winter but sometimes a nice bowl of soup fits the bill on a nice spring day too. The weather here in Wyoming has finally started to feel like spring with nice days in the 60’s and 70’s but the nights still cool down to the 30’s and 40’s so soup for dinner is not totally out of the question. As I was going through the pantry and refrigerator before making my twice a week shopping list and meal plan I took note of some items that I already had on hand…like a half of a container of pesto in the refrigerator, some cans of cannellini beans and a package of sun dried tomatoes in the pantry. I also spotted a carton of vegetable broth and knew I had carrots, onions and garlic on hand. Those are just staples in our home. I decided to go ahead and whip up a quick soup in the crock-pot before heading out to the grocery store. I pulled out the cutting board and a chefs’ knife and quickly chopped up some onion and minced some garlic. I found out I was out of regular carrots but had a container of baby carrots that I buy for healthy snacking…those would work. In fact using baby carrots allowed me to no have to peel the carrots first and cutting them up was so simple…just slice them up. I threw that all in my slow cooker. Added three cans of cannellini beans with the juices from the cans (I buy low sodium beans) and the juice from the can add body to your soup). Then I grabbed the pesto and tossed it in. I personally didn’t measure it out but I am good at eyeballing ingredients when I cook and I would say it was about 1/4 of a cup of pesto. Then I tossed in the sun dried tomatoes. Lastly poured in the carton of vegetable broth. I set it up to cook and I was off to the market where I bought some garlic knots plus all my regular weekly groceries. When dinner time came around I warmed up the rolls in the oven and ladled that soup into bowls and dinner was served! This soup had a ton of flavor and dipping my garlic knot into the soup was so good! 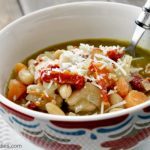 The kids even said it was pretty good (some of them are not big fans of beans in anything…but they ate this soup) and I love that it is a rather healthy soup at only 231 calories (8 Weight Watchers SmartPoints) per serving! We had exactly enough leftover soup for my husband and I to both have lunch the next day. And it was delicious! Topping the soup with a little Parmesan cheese sends it over the top. But totally optional! Dice the carrots, chop the onion and mince the garlic and add to a 5 quart or larger slow cooker. Add the canned beans, pesto, sun dried tomatoes and vegetable broth. Stir to combine and cover and cook on LOW for 6 hours or on HIGH for 4 hours. Top each serving with a little shredded Parmesan cheese before serving if desired. Warm bread and a side salad make a great easy meal! Enjoy! That should have been 14.5 ounces of beans. I have edited the recipe. Sorry about that Susan. So glad your family enjoyed this soup recipe Bonnie! I’m excited to make this tomorrow. Quick question about the beans. How many cans should I use? The text says you added 3 cans, but the recipe doesn’t include that. Thank you!! Thanks Caitlin for your comment, I am sorry I did not see it sooner. I have edited the recipe as it should be 43.5 ounces of canned cannelloni beans. Each can is 14.5 ounces.